If you have wandered along Church Street between Charles and Gerrard recently, you’ve probably noticed some major changes. There are a number of towers in various stages of completion from the new rental tower at 66 Isabella (I still miss seeing the green space!) to Vox condos at 28 Wellesley East and Eighty One Wellesley at … 81 Wellesley East. Further south, Zipperz is gone, making room for Axis Condos. Just north of Gerrard is 365 Church, which is 31 storeys and almost complete. Not much has happened between Dundonald and Wood, but all that could change with the recent announcement of a 43 storey tower proposed for the north west corner of Church and Wellesley, where the Rexall used to be, along with the buildings just west of there. While it would be a huge tower on a part of the street that is mostly low to mid-rises, several things differentiate this project from the others. 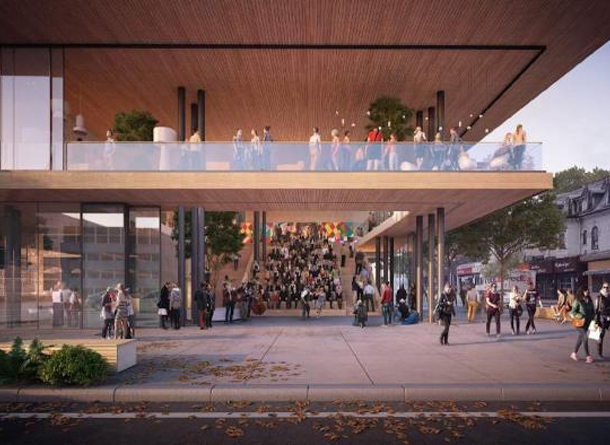 The first is that there will be community flex space at the base of the podium, designed according to UrbanToronto as an ‘homage to ‘The Steps’ where those of us who were around in the 90s used to congregate in front of the Second Cup. The second thing to differentiate this project is that it will contain 430 rental properties. The proposal includes 127 parking spots, but 430 bicycle parking spots, which makes sense. The vast majority of people who would live in this building would take transit, walk or bike to work or school. I think this development is going to be a good thing. We’re not losing any properties with historical value and between the public space and the upgraded retail (which should include several small-scale shops and restaurants as well as a grocery store), I think it will bring more life to the corner.